I have started reading House of Silk by Anthony Horowitz, the BAFTA-award winning creator of Foyle’s War and author of the bestselling Alex Rider children’s series, who was chosen by the Conan Doyle Estate to write a new full length Sherlock Holmes novel, and Anthony Horowitz has returned to the original books to produce a brilliant mystery novel, stripped back to the original style of Conan Doyle. 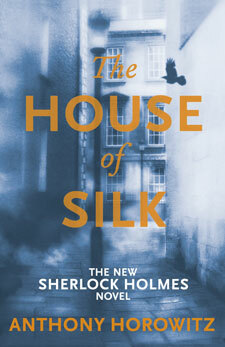 The House of Silk starts off in London November 1890 during a merciless winter when Sherlock Holmes and Dr Watson, are approached by an agitated art dealer called Edmund Carstairs who arrives at 221b Baker Street explaining that his paintings have been destroyed by a gang of Irish robbers, and asks Holmes for help, who employs the services of Keelan O’Donaghue leader of the Baker Street Irregulars. Ununfortunately one of the the Irregulars is later found brutally murdered by thugs of the House of Silk. So Holmes makes enquiries about the House of Silk, and is framed for murder and sent to prison. Meanwhile, Watson meets with a mystery criminal, who provides him with a key to free Holmes from prison, before the detective can be assassinated. His motives are uncertain, except that he wishes Holmes to rid the world of the House of Silk, they then investigate a traveling carnival, where they are ambushed, and learn of an illicit den on iniquity called the House of Silk. Commonwealth Day is the annual celebration of the Commonwealth of Nations held on the second Monday in March, and marked by a multi-faith service in Westminster Abbey, normally attended by HM Queen Elizabeth II, Head of the Commonwealth, with the Commonwealth Secretary-General and Commonwealth High Commissioners in London. The Queen delivers an address to the Commonwealth, broadcast throughout the world. In the year before the quadrennial Commonwealth Games, the Queen starts the Queen’s Baton Relay on Commonwealth Day at Buckingham Palace, handing the baton to the first relay runner to start a journey that will end at the Opening Ceremony of the upcoming Games. While it has a certain official status, Commonwealth Day is not a public holiday in most Commonwealth countries and there is little public awareness of it. Clementina Trenholme introduced Empire Day in Canadian schools, first in Dundas, Ontario in 1898, on the last school day before May 24th, Queen Victoria’s birthday. It was celebrated more widely throughout Canada each year. A typical Empire Day in Canadian schools occupied the entire day and included inspirational speeches by trustees and songs such as The Maple Leaf Forever and Just Before the Battle. Some of his earliest writing was published at the school, such as reports or spoof reviews in the school magazine Broadsheet He also designed the cover of one issue of the Broadsheet, and had a letter and short story published nationally in The Eagle, in 1965, he was awarded a place at St John’s College, Cambridge to read English, Which he attended from 1971, though the main reason he applied to Cambridge was to join the Footlights, an invitation-only student comedy club that has acted as a hothouse for some of the most notable comic talent in England. he graduated from St. John’s in 1974 with a B.A. in English literature. After leaving university Adams moved back to London, determined to break into TV and radio as a writer. The Footlights Revue appeared on BBC2 television in 1974 and also performed live in London’s West End which led to Adams being discovered by Monty Python’s Graham Chapman. The two formed a brief writing partnership, earning Adams a writing credit in episode 45 of Monty Python for a sketch called “Patient Abuse”, which plays on the idea of mind-boggling paper work in an emergency, a joke later incorporated into the Vogons’ obsession with paperwork. Adams also contributed to a sketch on the album for Monty Python and the Holy Grail. During this time Adams also continued to write and submit other sketches elesewhere, though few were accepted. In 1976 his career had a brief improvement when he wrote and performed, to good review, Unpleasantness at Brodie’s Close at the Edinburgh Fringe festival. Some of Adams’s early radio work included sketches for The Burkiss Way in 1977 and The News Huddlines. He also wrote the 20 February 1977 episode of the Doctor on the Go,television comedy series, with Graham Chapman, and later became the script editor for Doctor Who. The Hitchhiker’s Guide to the Galaxy was a concept for a science-fiction comedy radio series pitched by Adams and radio producer Simon Brett to BBC Radio 4 in 1977. Adams came up with an outline for a pilot episode, as well as a few other stories (reprinted in Neil Gaiman’s book Don’t Panic: The Official Hitchhiker’s Guide to the Galaxy Companion) that could potentially be used in the series. It started life in 1978 as a BBC radio comedy and a after the first radio series became successful, Adams was made a BBC radio producer, working on Week Ending and a pantomime called Black Cinderella Two Goes East. The Hitchhiker’s Guide to the Galaxy was also developed into a series of five books that sold over 15 million copies in his lifetime, a television series, several stage plays, comics, a computer game, and in 2005 a feature film. Adams’s contribution to UK radio is commemorated in The Radio Academy’s Hall of Fame. Adams also wrote Dirk Gently’s Holistic Detective Agency (1987) and The Long Dark Tea-Time of the Soul (1988), and co-wrote The Meaning of Liff (1983), Last Chance to See (1990), and three stories for the television series Doctor Who. A posthumous collection of his work, including an unfinished novel, was published as The Salmon of Doubt in 2002. Adams sent the script for the HHGG pilot radio programme to the Doctor Who production office in 1978, and was commissioned to write The Pirate Planet . He had also previously attempted to submit a potential movie script, which later became his novel Life, the Universe and Everything (which in turn became the third Hitchhiker’s Guide radio series). Adams then went on to serve as script editor on the show for its seventeenth season in 1979. Altogether, he wrote three Doctor Who serials starring Tom Baker as the Doctor: The Pirate Planet, City of Death and Shada Adams also allowed in-jokes from The Hitchhiker’s Guide to appear in the Doctor Who stories he wrote and other stories on which he served as Script Editor. Elements of Shada and City of Death were also reused in Adams’s later novel Dirk Gently’s Holistic Detective Agency, Adams is also credited with introducing a fan and later friend of his, the evolutionary biologist Richard Dawkins, to Dawkins’s future wife, Lalla Ward, who had played the part of Romana in Doctor Who. Adams played the guitar left-handed and had a collection of twenty-four guitars when he died in 2001 and also studied piano in the 1960s with the same teacher as Paul Wickens, the pianist who plays in Paul McCartney’s band (and composed the music for the 2004–2005 editions of the Hitchhiker’s Guide radio series). The Beatles, Pink Floyd and Procol Harum all had important influence on Adams’s work. Adams included a direct reference to Pink Floyd in the original radio version of The Hitchhiker’s Guide to the Galaxy, in which he describes the main characters surveying the landscape of an alien planet while Marvin, their android companion, hums Pink Floyd’s “Shine on You Crazy Diamond”. This was cut out of the CD version. Adams also compared the various noises that the kakapo makes to “Pink Floyd studio out-takes” in his nonfiction book on endangered species, Last Chance to See. Adams’s official biography shares its name with the song “Wish You Were Here” by Pink Floyd. Adams was friends with Pink Floyd guitarist David Gilmour and, on the occasion of Adams’s 42nd birthday (the number 42 having special significance, being the Answer to the Ultimate Question of Life, the Universe and Everything and also Adams’s age when his daughter Polly was born), he was invited to make a guest appearance at Pink Floyd’s 28 October 1994 concert at Earls Court in London, playing guitar on the songs “Brain Damage” and “Eclipse”. Adams chose the name for Pink Floyd’s 1994 album, The Division Bell, by picking the words from the lyrics to one of its tracks, namely “High Hopes”. Gilmour also performed at Adams’s memorial service following his death in 2001, and what would have been Adams’ 60th birthday party in 2012. I have recently watched another really fascinating BBC nature documentary The Living Planet: A Portrait of the Earth. 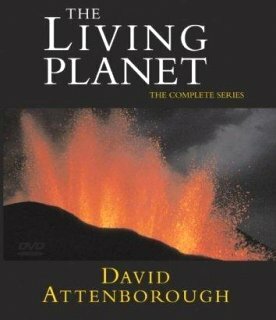 Written and presented by David Attenborough it is The sequel to his pioneering Life on Earth, and studies the ways in which living organisms, including humans, adapt to their surroundings. Each of the episode features a different environment. it is Part of the ‘Life’ series, and was followed by The Trials of Life . The first episode “The Building of the Earth” begins in the world’s deepest valley in the Kali Gandaki river in the Himalayas, which were formed from the sea bed some 65 million years ago . Its temperatures range from those of the tropics in its lower reaches to that of the poles higher up & shows how creatures become adapted to living in certain environments. , Attenborough also visits an erupting volcano in Iceland and the Giant’s Causeway. The Icelandic volcanoes represent the northern end of a fissure which runs down one side of the globe, forming volcanic islands above sea level. This activity,is known as plate tectonics and formed Africa and South America and created the Atlantic Ocean.It is this activity beneath the Earth which caused the eruption of Mount St. Helens in 1980 and Krakatoa in 1883, and results in new land being formed, and hot springs and caverns being formed — which themselves support life. In The next programme “The Frozen World” Attenborough visits Mount Rainier in America to demonstrate inhospitable environments, where there is no vegetation, therefore no herbivores and thus no carnivores. However, beneath its frosty surface, algae grow and some insects, such as ladybirds visit the slopes. Africa’s mountains are permanently snow-covered, and beneath peaks such as Kilimanjaro and Mount Kenya, there are communities of plants and animals. However, they must survive extremes of temperature. At night they are in danger of freezing solid, and during the day they may be robbed of moisture. Lobelias combat this by either producing pectin or insulating themselves with an abundance of leavest. The Andes run the length of South America and are surrounded by the altiplano. On these high plains there is a large and varied population of animals. Antarctica is bigger than the whole of Europe and is for the most part devoid of life. However, its shores and waters are fertile and are home to fur seals, their main food (krill), and several species of penguin. By contrast, because of its connection to more temperate regions, the Arctic has been colonised by a large variety of species, including Arctic Foxes, polar bears, lemmings, Snowy Owls, and is also a temporary home to migratory animals, like the caribou and snow goose. Episode three “The Northern Forests” examines the northern coniferous forests beginning in northern Norway, north of the Arctic Circle, which has only just enough light for the pine trees to survive, and is extremely cold during the winter. Pine cone seeds provide one of the few foods available. However, there are predators, including lynxes, wolverines and eagle owls. The coniferous forest grows in a belt right around the globe some 1,900 kilometres across. On each continent, many migratory animals arrive in the spring, and even more during the summer. In years when the vole population is high, the numbers of , predators, increase correspondingly and spread out. Further south, the pine trees give way to broad-leaved species, such as the oak and beech. Where birds feed on a myriad of insects during the summer. many animals in these forests hibernate over Winter, including the black bear, which can be asleep for six months at a time. further south, Attenborough discovers the effects of forest fires, which are not as destructive as they appear and are necessary to generate new growth. The next episode “Jungle”is devoted to the jungles. Attenborough ascends to a canopy in the South American tropical rainforest to observe just how many species they support. The climate is moist all year round hence no seasons, so trees can flower at various times throughout the year, and many species rely on birds and insects for pollination and using ingenious methods to attract them. Bromeliads have their own population of visitors, largely due to their chalice-like rosettes of leaves that hold water. This is used by some for drinking, or, as in the case of the poison dart frog, for depositing tadpoles. Attenborough examines how camouflage, can aid survival. Around halfway down, there is little life, apart from those that inhabit nest holes, such as macaws, or use the trunks and lianas to aid movement. The jungle floor is not very fertile as the rain washes away any nutriment from the soil. Tree roots therefore rely on a kind of compost formed from decaying leaves — a process that is greatly accelerated by humidity. After a tropical storm,some trees collapse, leaving a gap in the canopy above and saplings race to become the first ones to fill the gap. The next programme “Seas of Grass” looks at a plant of which there are some 10,000 species and which covers over a quarter of vegetated land: the grasses, where lizards prey on insects, praying mantises eat grasshoppers, spiders hunt anything they can and dung beetles clear up the mess. Termites are among the most successful: in the savannah of Brazil, there are more termite mounds per acre than anywhere else — and where they flourish, the anteater follows. At dawn on the Brazilian campo, many open-nesting birds are vulnerable to predators. There are few trees because of little water and during the dry season, caiman and turtles compete for water. In Venezuela, the clay soil enables the land to hold flood water, and some creatures, such as the capybara, relish it. on the North American prairie, the freezing temperature of minus 46 °C means that few animals can survive here apart from the the bison. The African plains have a greater variety and bigger concentration of grass-living animals than any other. This leads to a similar abundance of predators. The episode “The Baking Deserts”explores the world of deserts and begins in the Sahara, where the highest land temperatures have been recorded. Rock paintings depict creatures such as giraffes and antelopes, suggesting that at one point there was enough vegetation to support them. Now, such life has all but disappeared, with the exception of the cypress, whose roots find water deep underground. Since the night brings low temperatures, many of the creatures that live there are nocturnal. They include Fennec Foxes, geckos, jerboas and caracals. A scorpion is shown fighting a black widow spider. During the day, the desert belongs to the reptiles, which rely on the sun to warm their bodies. The Sonoran Desert is home to the Gila monster, one of the two poisonous lizards. By mid-afternoon, it’s so hot that even reptiles must escape the sun’s rays. However, some birds have developed methods for keeping cool. The sandgrouse evaporates moisture by fluttering its throat, while the road runner also uses its tail as a parasol. Plants that are best adapted to the habitat are the creosote bush and cacti, of which the saguaro is one of the biggest. The nomadic Tuareg people cross the Sahara from one side to the other — but can’t do so unaided. They rely on the camel for transportation, as much as it needs them to periodically dig for water. Despite this, it is one of the best adapted desert animals: it can go without water for ten times as long as a man. Episode 7 “The Sky Above” deals with the air and those creatures that spend most of their lives in it. Attenborough begins in NASA’s gravity research aircraft to illustrate the effect of weightlessness. There are surprisingly many plants whose seeds are, in effect, lighter than air. Gossamer is the animal equivalent, spun by tiny spiders. Only the very smallest plants and animals can defy gravity, but some seeds, such as those of the sycamore, cheat this by simulating the movement of a helicopter. Many creatures are expert gliders, such as the flying frog and some species of lizard. However, those that live at grass level must use powered flight, sometimes aided with a leap, as with the grasshopper. Attenborough observes albatrosses in South Georgia exploiting the air currents above cliffs to glide all day. Heavy birds like vultures wait for the land to heat up and provide thermals before they attempt any lengthy flight. The techniques of diving birds, such as the gannet or the peregrine falcon, are shown. Migratory birds are also explored in detail, and a multitude assembles above Panama each autumn. The red-breasted goose migrates entirely overland, and so can stop for fuel every night — unlike those that cross the open ocean. Finally, Attenborough ascends 6.5 kilometres into the atmosphere in a hot air balloon. It is this space that contains the Earth’s weather, and satellite imagery is used to illustrate the formation of hurricanes and tornados. The next programme “Sweet Fresh Water” focuses on freshwater habitats. Only 3% of the world’s water is fresh, and Attenborough describes the course the Amazon, starting high up in the Andes of Peru, whose streams flow into the great river. Young rivers are by nature vigorous and dangerous: they flow fast and form rapids, thick with mud and sediment. They accumulate sand and gravel en route, and this erodes all but the hardest surrounding rocks. The Yellow River of China carries the most sediment of any river. By the time it has settled down and fallen over its last cascade, the water becomes tranquil and rich with nutrients from its banks. It begins to form lakes, and where the water flows into basins created by geological faults, they can be immense. When water reaches such areas, it loses its impetus and drops its sediment, potentially making it very fertile. Lake Baikal in Russia is the deepest: 1,500 metres. In addition, 80% of its inhabitants are unique, including the Baikal Seal. There are many examples of creatures that thrive in such an environment. Predators lie in wait above the surface (kingfishers), below it (turtles), on it (water boatmen), and at its edge (fishing spiders). In its final stages, a river’s tributaries are liable to burst their banks and flood. However, some have made a virtue of this: the Marsh Arabs of Iraq construct their buildings on rafts of reeds. This allows fish, pelicans and humans to flourish in a single community. The 9th episode “The Margins of the Land” examines coastal environments and the effect of tides, of which the highest can be found in the Bay of Fundy in North America. In places, erosion is causing the land to retreat, while in others — such as the tropics — the expansion of mangroves causes it to advance. Mussels keep their shells closed at low tide to deter attackers but the oystercatcher is adept at dealing with them. Other estuary wading birds, which have developed a multitude of techniques for gathering food from mud flats, include godwits, curlews, dunlins, Ringed Plovers and avocets. While glasswort grows on many European tidal banks, the mangroves of the tropics are extensive. The largest forest is in the Sundarbans at the mouth of the Ganges and is 370 square metres in size. Where waves meet rocks and cliffs, the bands between low and high tides are narrow, and creatures have developed according to their dietary and safety needs. Mussels are preyed on by starfish, and so ensure that they are out of reach at low tide. Barnacles are higher still and feed on microscopic particles. On a Costa Rican beach, Attenborough observes female Ridley turtles arriving at the rate of some 5,000 an hour to deposit their eggs. Finally, he discovers the largest turtle, the giant leatherback, also laying eggs. He remarks that despite its great size, little is known about it — except that its eggs are easily plundered, thus making it an endangered species. The next episode “Worlds Apart” investigates remote islands and their inhabitants. Some islands are tips of volcanoes; others are coral atolls. Those that colonise them transform into new species with comparative speed. Attenborough visits Aldabra in the Indian Ocean, which is 400 kilometres from the African coast. It has a vast population of sooty terns, which enjoy a degree of protection from predators that is unavailable on the mainland. The giant tortoise has also proliferated, despite the inhospitable nature of the landscape. Many island birds become flightless, including the Aldabran rail and the extinct dodo of Mauritius. Living in such isolation seems to allow some species to outgrow their mainland cousins, and Attenborough observes a group of feeding Komodo dragons at close quarters. The volcanic islands of Hawaii have become rich in vegetation and therefore a multitude of colonists: for example, there are at least 800 species of drosophila that are unique to the area. Polynesians reached Hawaii well over a thousand years ago, and their sea-going culture enabled them to reach many Pacific islands, including Easter Island, where they carved the Moai, and New Zealand: the ancestors of the Maori. Attenborough highlights the kakapo as a species that was hunted to near-extinction. It is a facet of animal island dwellers that they have developed no means of self-defence, since their only predators are those that have been introduced by humans. The penultimate programme”The Open Ocean” concentrates on the marine environment. Attenborough goes underwater himself to observe the ocean’s life forms and comment on them at first hand. He states that those that live on the sea bed are even more varied than land inhabitants. Much sea life is microscopic, and such creatures make up part of the marine plankton. Some animals are filter feeders and examples include the manta ray, the basking shark and the largest, the whale shark. Bony fish with their swim bladders and manoeuvrable fins dominate the seas, and the tuna is hailed as the fastest hunter, but the superiority of these types of fish did not go unchallenged: mammals are also an important component of ocean life. Killer Whales, dolphins, narwhals and Humpback Whales are shown, as well as a school of beluga whales, which congregate annually in a bay in the Canadian Arctic — for reasons unknown. Marine habitats can be just as diverse as those on dry land. Attenborough surmises that the coral reef, with its richness of life, is the water equivalent of the jungle. Where the breezes of the Gulf Stream meet those of the Arctic, the resulting currents churn up nutrients, which lead to vegetation, the fish that eat it, and others that eat them. Attenborough remarks that it is man who has been most responsible for changing ocean environments by fishing relentlessly, but in doing so has also created new ones for himself — and this leads to the final episode.